Sports simulations are the best they have ever been; NFL, NBA, MLB and NHL are all significant annual sports releases. Unsurprisingly then, it’s FIFA that’s the biggest sports series in the world today, derived from the biggest sport the world has to offer. 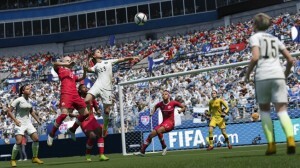 FIFA 15 produced as exciting a game of football as has ever been coded. So surely FIFA 16 is the greatest football game so far? Somehow, it isn’t. What could possibly have gone wrong? FIFA 15 was akin to the English Premier League; fast, hi-octane football, quick passing, end-to-end attacking and of course, goals galore. It did have issues such as pace being overpowered, leading to irritating long ball techniques that had an alarming success rate. And that is the main issue with FIFA 16 in that it is trying too hard to almost undo the faults of the previous year. What comes out is more akin to watching a Spanish League game; stop-start football and horrendous officiating with moments of brilliance thrown in. FIFA 16 is much slower than 15, I assume as an attempt to tighten up the defence and stop the dominance of pacey players. It works to a degree, but often leads to a very scrappy, clumsy game of football; collisions galore, often ending in baffling foul decisions, which can be costly, and there is nothing you can do about it. Here’s the thing; the pacey players still get that advantage their stats dictate, except that once they have the ball that stat appears to be irrelevant. Even the fastest players appear to be running through treacle. Passing is also an issue at times. A new addition is Pass with Purpose (using RB) which produces a much quicker, firing-to-feet pass, which has resulted in the normal pass becoming much slower and easier to intercept. You feel forced into using Pass with Purpose, yet few players have good enough control for it to be useful, so frustration ensues again. I understand the overall goal of making a balanced game of football, yet as a result of these changes it often becomes more of a game of chance. Defending in FIFA 16 is also dramatically different. I’ve always preferred using the slide tackle for the last few years of FIFA, so it’s pleasing that you actually get up before your opponent for a change! More concerning however is that it appears the slide tackle is now the best form of defence, which of course presents a high level of risk. Block tackles have been heavily watered down, instead defenders are like mice retreating into a corner with the cat coming straight for them. Anyone attacking with any measure of dribbling skill will often be able to walk through the defence, ready to slot home. The AI is much improved, which provides some relief from these defensive concerns, should you take your hands off the controls. Concerning, yet with practice springs great reward. While that all sounds negative, 16 still provides excellent fun. You learn to live with these changes as you develop, and while from time to time these become moments of frustration, much like the real thing, they often bring great reward for your efforts. But what about the rest of the package? The presentation has to be lauded, as anyone would come to expect from FIFA. Whilst not anything dramatically different to last year’s base dashboard, it’s been touched up nicely. The stadiums and atmosphere have never looked and sounded so good. Live information provided when you log on, such as goal replays from the past week, tips and tricks videos and internet links are excellent, providing a full football hub for any fan. Then there is Ultimate Team. 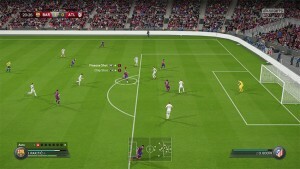 Easily the best mode in any FIFA game since its inception in FIFA 09, and much has improved yet again this year. The most significant addition is FUT Draft Mode, which allows you to choose from a given random deck of player cards for each position, making the best chemistry team possible, evading the trials and tribulations of the transfer market. As someone who refuses to spend real cash on micro-transactions, it was nice to be able to pick from the best players the game has to offer, something only the biggest slice of luck (and money) would provide in previous years. But even FUT Draft is tainted; after the initial draft is completed, each draft after that costs in-game or real currency, in typical EA fashion. 15,000 coins can buy you a permanent budget squad that’s yours to keep, whereas in draft you get the best players, but only for a maximum of 4 matches at a time. I can only surmise FUT Draft was created for the YouTube community, although participation does yield squad-building rewards. The headline-grabbing addition is something never ever seen in a football game before – Women’s Football. This is limited to online/offline friendlies and tournaments, and they cannot compete against the men’s sides. The Women’s Football offers a less physical but more controlled and technique-focused approach and a great alternative to the norm. It’s nice to see that it’s not just the male character models with ponytails. As the women’s game gets bigger here’s hoping for an expansion next year. So while FIFA 16 doesn’t quite hit all the high notes with its gameplay changes, it’s still damn fun. On the plus side, it’s far from just an annual update; the presentation and modes alone are pushing the genre even further. I’m still managing to lose hours and hours on it and that is a sure fire sign of success. It’s certainly a better overall package than PES 2016, even if the football is a bit scrappy. I’m sure EA won’t mind that. Curious about the verdict? Read our review policy. Kevin is a 33 year old self-confessed addicted gamer since the tender age of.... as long as he can remember. From early years on Granny’s Garden on the BBC Micro, Dizzy on the ZX Spectrum (128k no less), and Pitfall on the Atari 2600, all the way through all the generations of console gaming. Now he wastes his hours on FIFA, anything with a great plot/intense action, and retro platforms. Also addicted to video game soundtracks.